It’s the bottom of the ninth and the team is down two-zero... It’s Charlie Brown’s chance to be a hero. 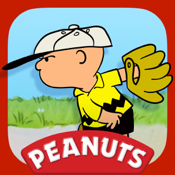 Will the Peanuts gang win the biggest baseball game of the summer? Charlie Brown’s All Stars! magically springs to life in this charming interactive storybook designed for the iPad, iPhone and iPod Touch. Peanuts fans will delight in sharing this classic story of team spirit and friendship for a whole new generation of underdogs! Touch, tilt and swipe your way through tons of summer fun with your favourite Peanuts characters! Take to the mound with Charlie Brown, swing a bat with Linus and make a very special uniform with Lucy and the rest of the team. And don’t forget to hang ten with Surfing Snoopy and practice your skateboarding tricks with the gang! Narrated by Stephen Shea, the voice of Linus van Pelt, this classic summertime story of team spirit and friendship comes alive with beautifully re-mastered illustrations, voices and music from the original 1966 animated TV special.